On the homepage of a US-based company website is a picture that, at first glance, looks like an advertisement for a major household appliance. A yellow starburst graphic assures you that delivery time is quick. A text-boxed baseline price is presented in glowing type. And at the centre is the touted item: an ILC/TESLA-type accelerator cavity. 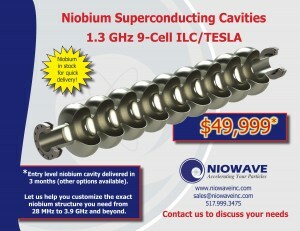 Through the ad, Niowave, Inc., a superconducting linear accelerator company based in Lansing, US, showcases its capability for producing cavities with relatively short turnaround times. For the accelerator community, the ad could be a sign that the production of these superconducting structures is very slowly inching its way towards a place in the market as an in-stock product. 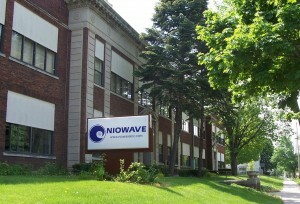 Niowave is one of several US companies developing superconducting technology for the ILC. To weld its cavity cells together, it relies on C.F. Roark, a partner company in Indianapolis, US. It’s too early to predict how well cavities will do in the market as a prefabricated good, but Terry Grimm, who started the company in 2005 and worked extensively with particle accelerators as a laboratory and university physicist, knows there’s a niche for them outside high-energy physics. Cavities for the ILC are a much taller order than those for commercial projects. The niobium is purer, the gradients are higher and the basic structures have complicated add-ons. Commercial projects don’t require as much of their cavities. But in the course of developing state-of-the-art niobium structures, you learn a few things that can only help when manufacturing simpler systems. “That work could work out well for them, even for the sake of the technology, not just the company,” Ross said. For Niowave, developing the technology isn’t just about maximising gradients. It also means perfecting a basic, so-called Entry Level model of superconducting cavity, much like the no-frills Chevrolet. This 20 megavolt-per-metre cavity can be produced at a significantly lower cost than the ILC’s 35 MV/m ‘Cadillac’ standard model, and since many of the company’s customers don’t need the highest possible gradients, the Entry Level could go over well with a fair share of their clients. Niowave sees enough of a market that it stockpiles raw niobium so that it’s within arm’s reach, ready to be treated and shaped when an order comes in. It’s the only company in the world that can make that claim. 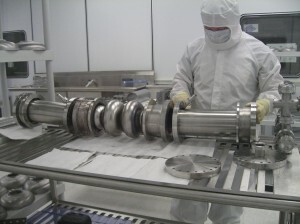 Being able to pull niobium off the shelf is the convenient first step in an operation that develops turnkey accelerator systems, including cryogenics and beam testing. Conveniently, the company has a radiation generating license that allows them to conduct beam tests, something that’s otherwise reserved for laboratories. Developing such systems is a relatively young enterprise for industry in the US. Other fields seem to be feeling the effect of the push. Niowave’s free-electron laser systems can help see through a cargo container that might be carrying illegal weapons materials. The company is also developing superconducting cavities for electron microscopes in which the high-frequency pulsed electron beam would make it possible to image a series of snapshots in a chemical reaction. There, researchers hope to be able see the chemical reactants transform into products in front of their eyes. The same push to make better superconducting linacs has also been felt in the Lansing region’s economy, best known for automobile manufacturing. Also, Michigan State University, home of the National Superconducting Cyclotron Laboratory and future Facility for Rare Isotope Beams (FRIB), is a hub of atomic and particle physics expertise. A recent renewal of high-technology manufacturing has brought life to an area hit hard by the 2008 recession. The multiplier effect, said Bob Trezise, CEO of Lansing Economic Development Corporation, is significant. While reaching out to other areas of exploration, Niowave will continue developing cavities for the ILC. “They have the opportunity to show that there’s a small business model for this technology,” Ross said.